Removal, rebuilding and repair of shock absorbers on radio control (RC) model vehicles is a fairly simple process requiring only a couple of tools and a rebuild kit, easily obtained from your local hobby shop. If the hobby shop does not have rebuild kits, they can usually be ordered from the manufacturer's website. Don’t feel overwhelmed by the number of steps given. 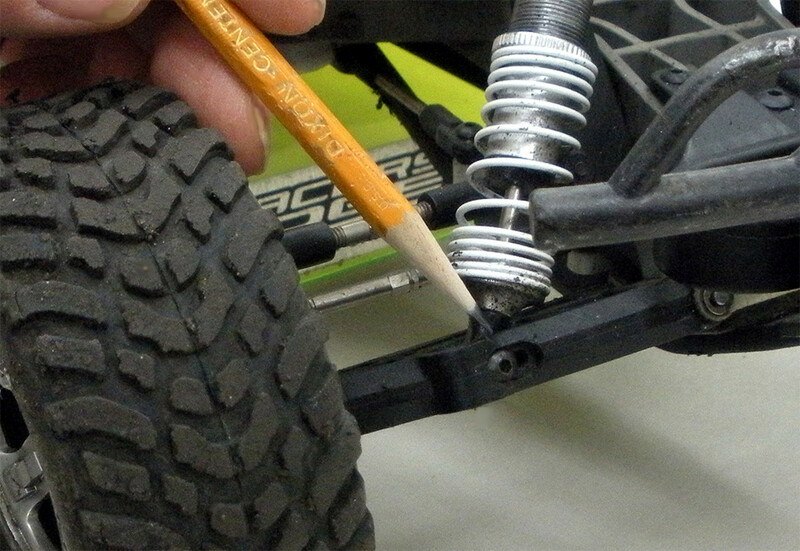 Just read them over once to become familiar, then follow them one at a time, and you’ll find that removal, rebuilding, and replacement of the shocks is actually one of the simplest repair tasks on an RC car or truck. The steps are the same, regardless of whether you are racing electric or nitro models. Most shocks in modern RC cars have a pressure bladder insert. 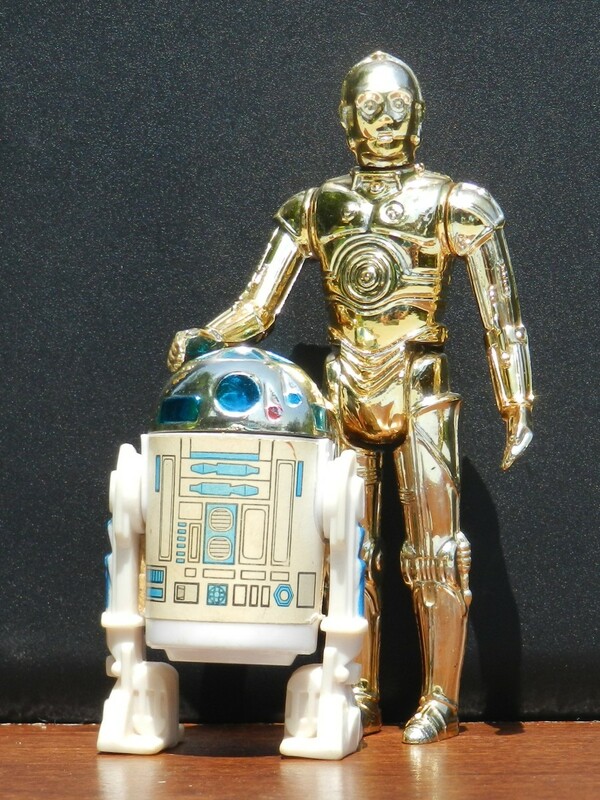 Older ones may not have them. The instructions here will address the pressure bladder type—if yours does not have them, no worries. The steps are all the same; simply disregard references to the pressure bladder and proceed with the rest of the steps. You can follow along with the photos I’ve taken to match each step. 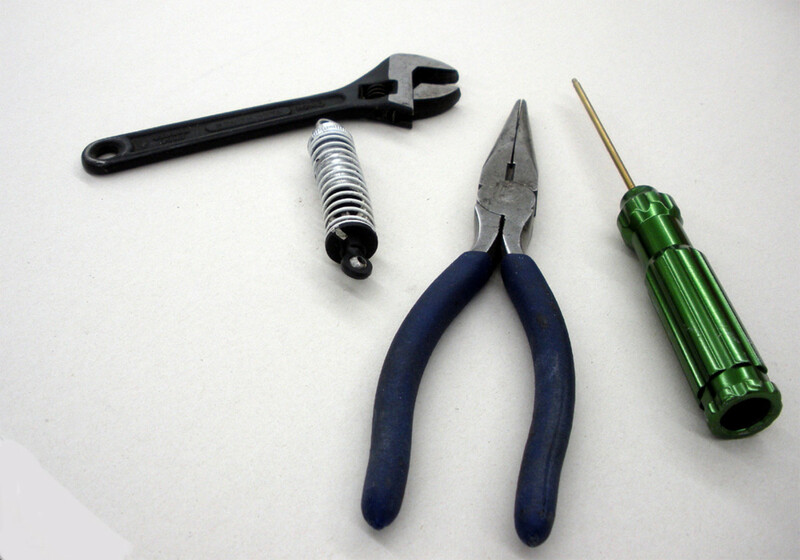 Left to Right: small adjustable wrench; rebuild kit; needle-nose pliers; small screwdriver. First, a rebuild kit, specific to your brand and type of RC car. A small adjustable wrench (often referred to as a Crescent Wrench) will be necessary, and you might also need a pair of small needle nose pliers. Next, a jeweler's or hobbyist's screwdriver or small Allen wrench. 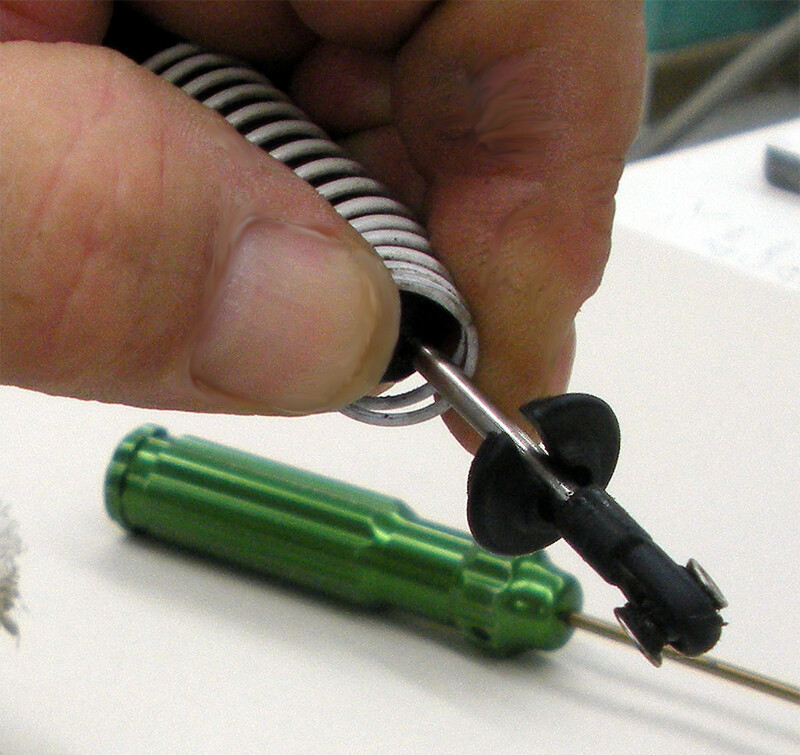 Many brands use the 'Torx' type screwdriver for mounting the shocks to the cars. A small jar to hold the used oil until it can be disposed of properly: you don't want it in the trash can or messing up your work area. A rag, in case of any spills. Remove the shocks from the vehicle by removing the screws at top and bottom of each. There are two screws per shock, so if you are doing all four shock absorbers, you'll have 8 screws to keep track of. I recommend removing just one shock absorber at a time, however. This is especially true if your car has different front and rear settings, or different side-to-side settings. 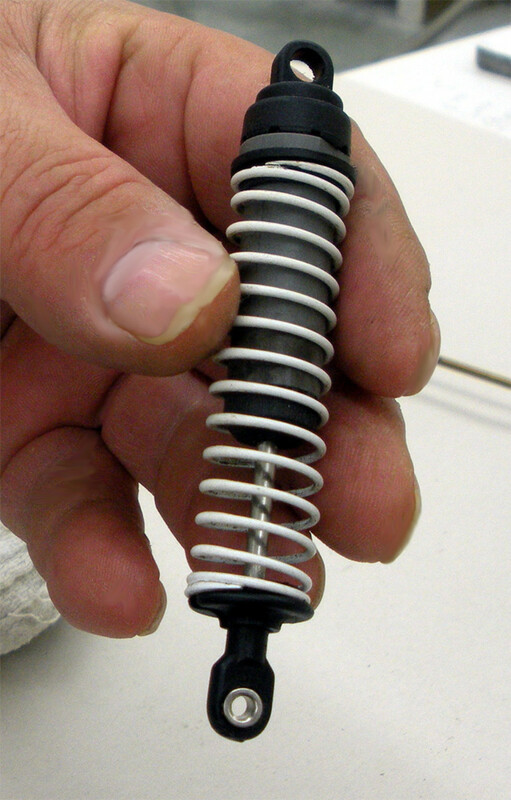 To disassemble the shock hold it in both hands and use your fingers to retract the spring and remove the spring retainer clip from the bottom of the shock plunger shaft. The spring retainer is a circular part that looks like a thick washer, but with a slot cut from one side. 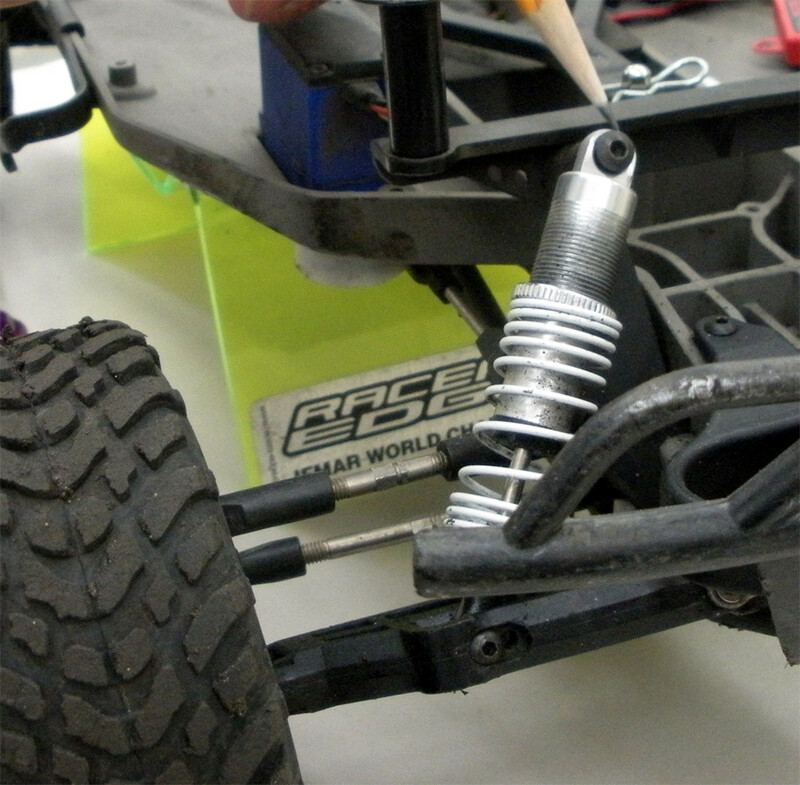 The hole in the center fits snugly at the base of the shock, but the slot is not large enough to slide off the hub. Simply push or pull the retainer upward toward the shock body until it slides over the plunger shaft, where it can then be removed by pulling it straight back through its keyway. Then slide the spring off the shock body. To open the shock body to start your rebuild, you'll need the adjustable wrench. Fit it to the sides of the top of the shock body. On many models, there are flattened sides made to accept the wrench. Use the small screwdriver or Allen wrench through the eyelet at the top of the cap as a turning lever while holding the adjustable wrench (or pliers) securely on the shock body. (Remember: “righty-tighty; lefty-loosey.”) Once it is loose, finish removing the cap with your fingers. Do not tip the shock body as you are doing this, or the oil will spill out. Once the disassembly is done, then you can dump the old oil into your jar for proper disposal later. 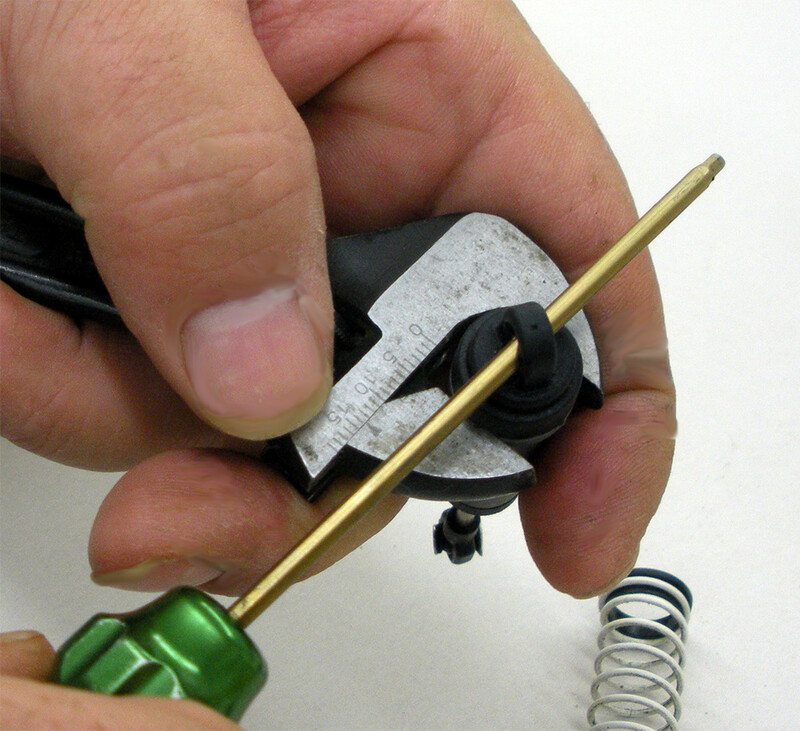 Using screwdriver to turn the cap. Note shock is held upright for this operation. 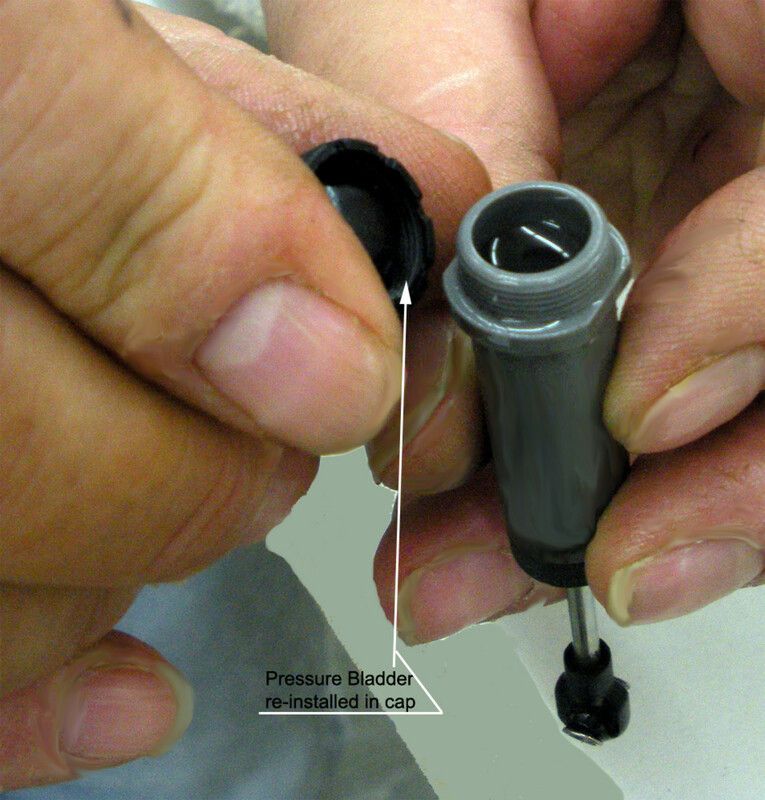 Remove the pressure bladder (a small rubber diaphragm) from either the top of the shock body, or from inside the cap, as it will sometimes stick in the cap. Empty the old oil into your little jar. 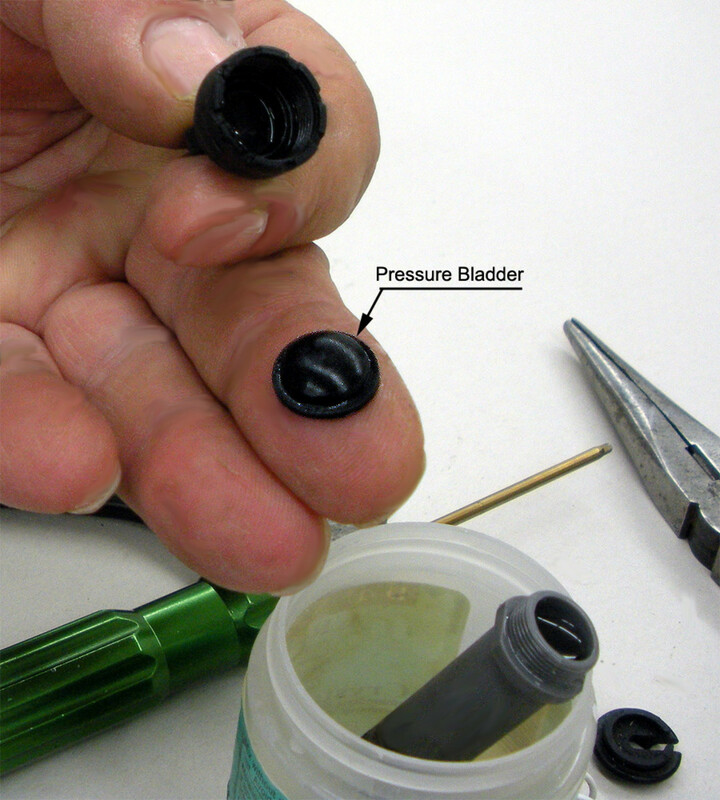 Worn pressure bladder removed; note its small size, and resemblance in shape to a contact lens. Be careful not to lose the new one! 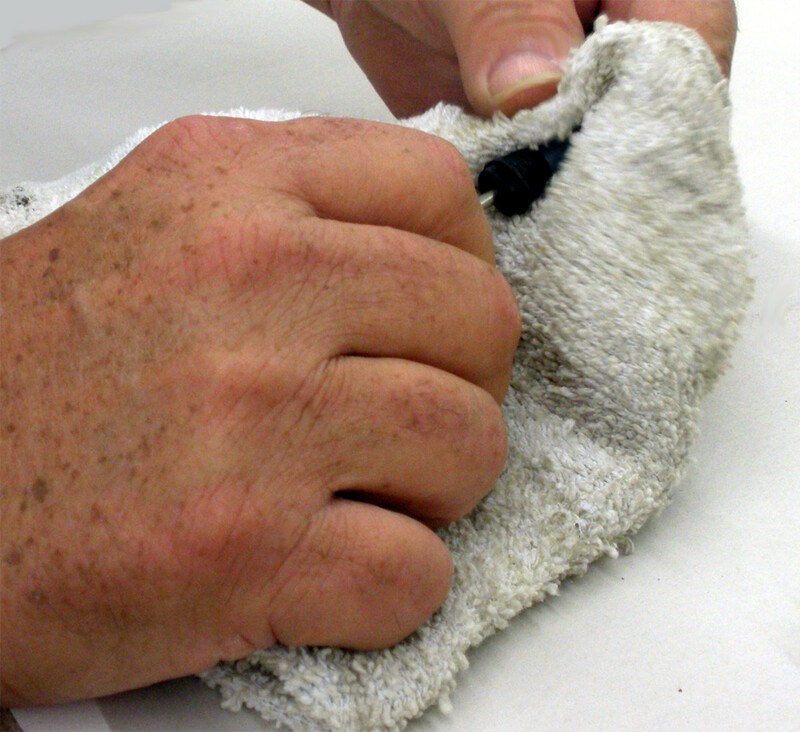 Clean the entire assembly, using electric motor cleaner or nitro cleaner, and wipe dry. 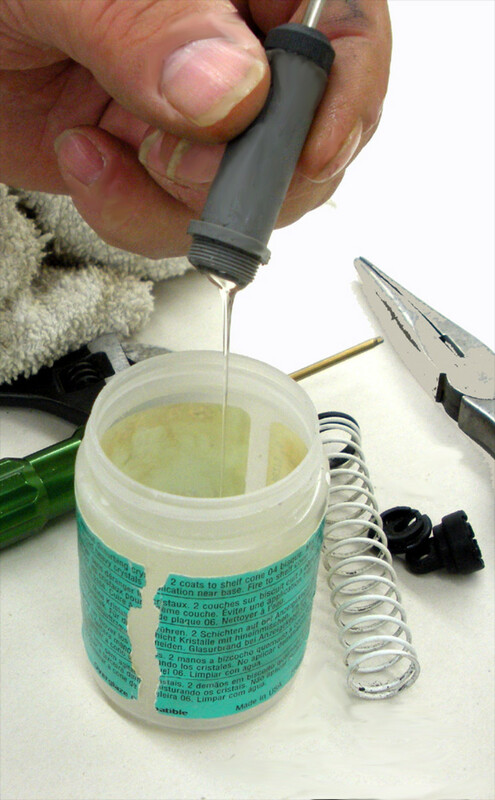 Refill the shock with the proper type of oil as specified for your vehicle model. 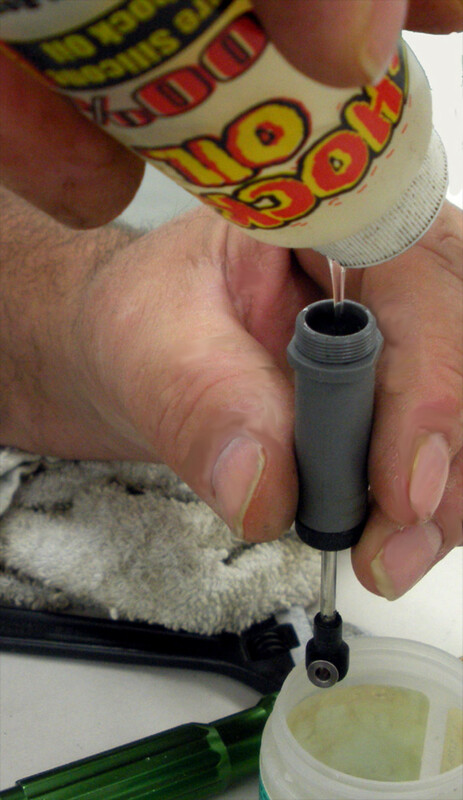 The oil should be filled only to the level of the bottom of the threads that accept the cap. Replace the pressure bladder with the new part from the rebuild kit into the cap--domed side toward the open end of the cap. 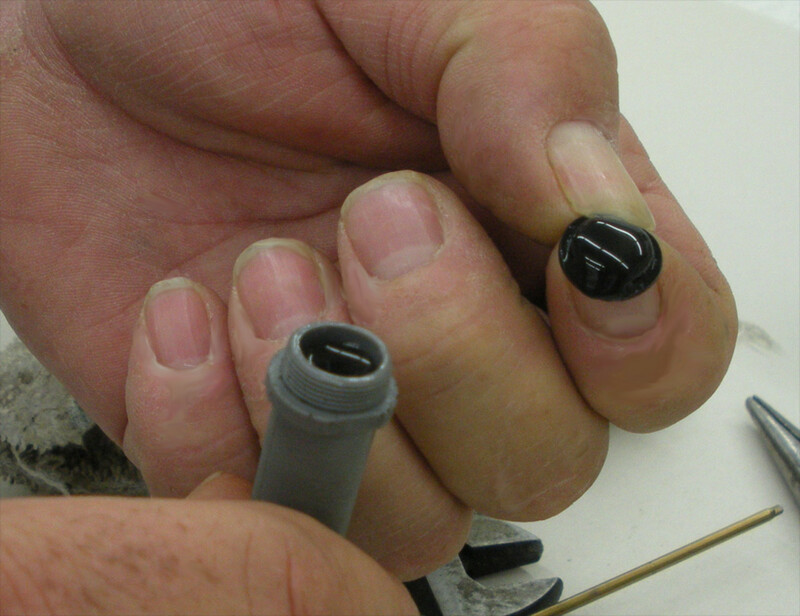 Holding the shock body in one hand, use the fingers of the other hand to slowly push the plunger up almost to the top, but do not allow any oil to be pushed out. Oil is defined as "hazardous waste." Do not dump it down drains of any type. Dispose of it according to local ordinances. Hold the shock body over your jar when filling, so any spills go in the jar. Shock body can rest in your small jar if a shock stand or scrap wood is not available. To re-assemble, replace the cap, being careful not to drop the pressure bladder. Tighten just finger-tight to start with, so the oil does not spill. As you are screwing on the cap, keep your fingers away from the plunger shaft extending from the bottom of the shock body--the plunger should move downward as the cap is tightened. 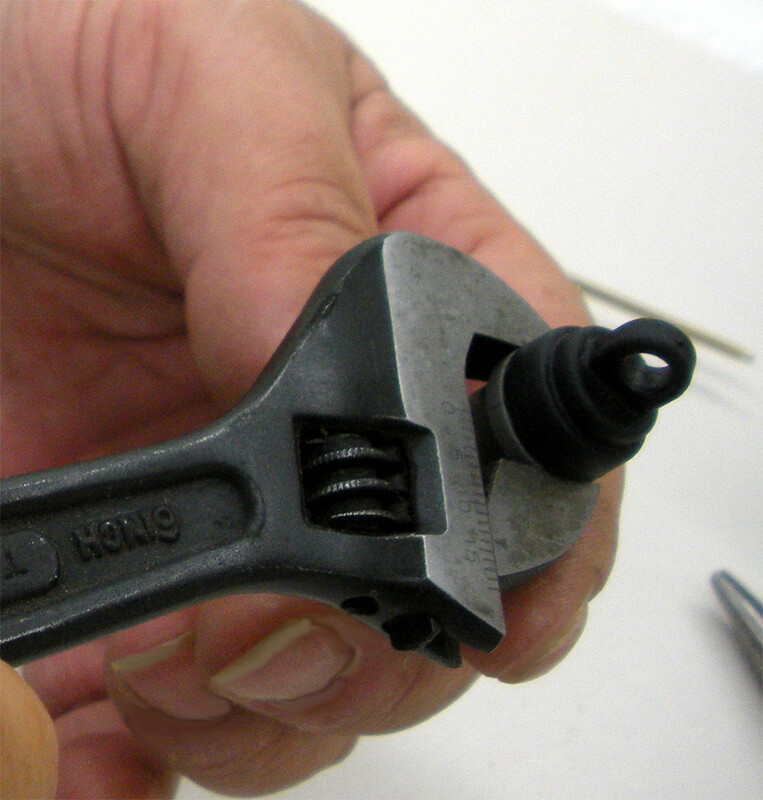 Using the adjustable wrench (or pliers) and screwdriver or Allen wrench again, re-tighten the cap. 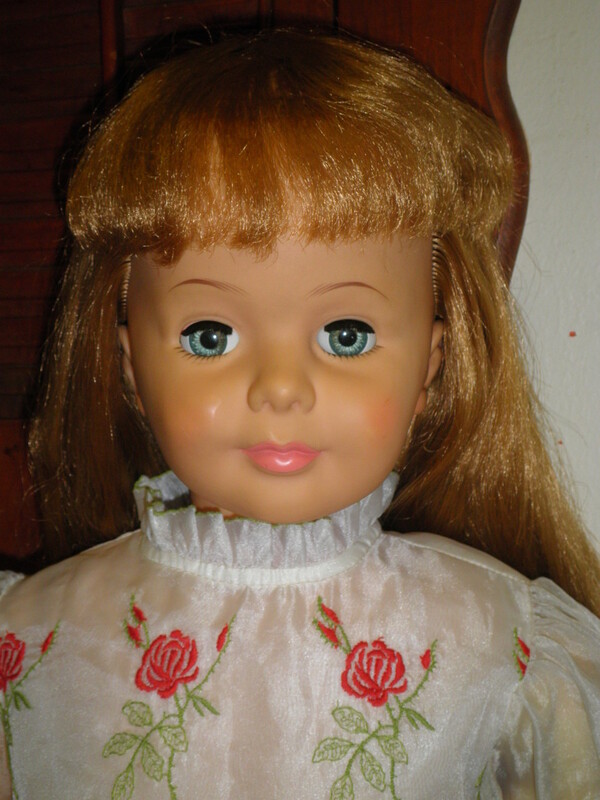 Be careful not to over-tighten, as the threads are easily damaged by over-tightening. Test the shock by pushing upwards on the plunger. When released, it should come back down on its own. If it cannot be pushed up, there is too much oil--return to step 3 and remove a little oil, and again follow all instructions to this point. If it does not come back down on its own, there is not enough oil--return to step 3 and add a little more, and again follow all instructions to this point. Test again. When the test shows proper operation, proceed again through the remaining steps. 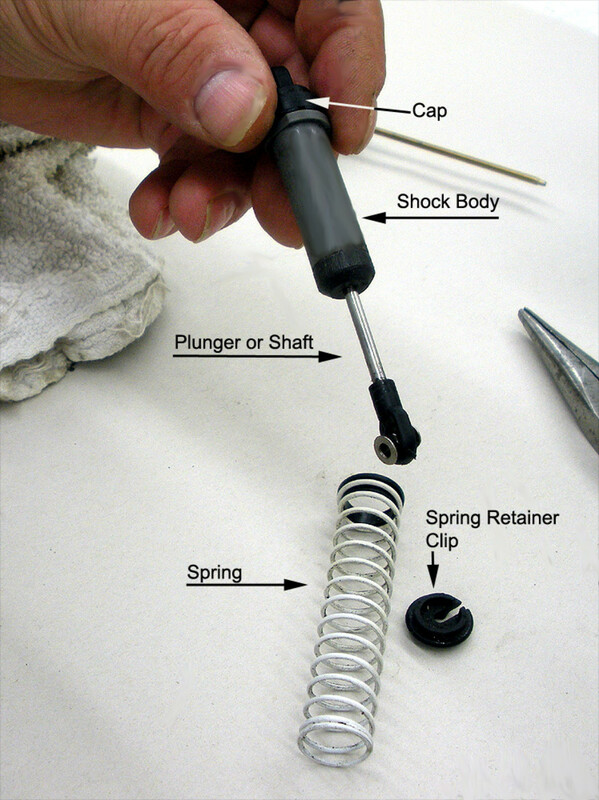 Slide the spring back over the shock body, and retract it with your fingers, as you did for removal, and replace the retainer clip to the bottom of the shock plunger shaft. Replace the shock into the vehicle. Repeat all steps for each of the four shocks, and you are finished. Depending on the type of racing, there may be different oil weight specifications, and for some types of racing, even a different weight oil between front/rear and left/right side shocks. 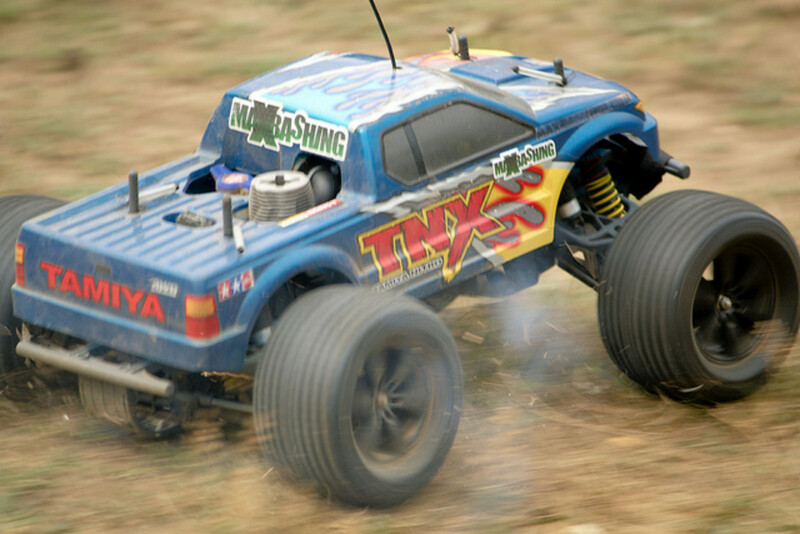 There will also be a difference of oil specifications for different scale RC cars, and for nitro or electric as well. 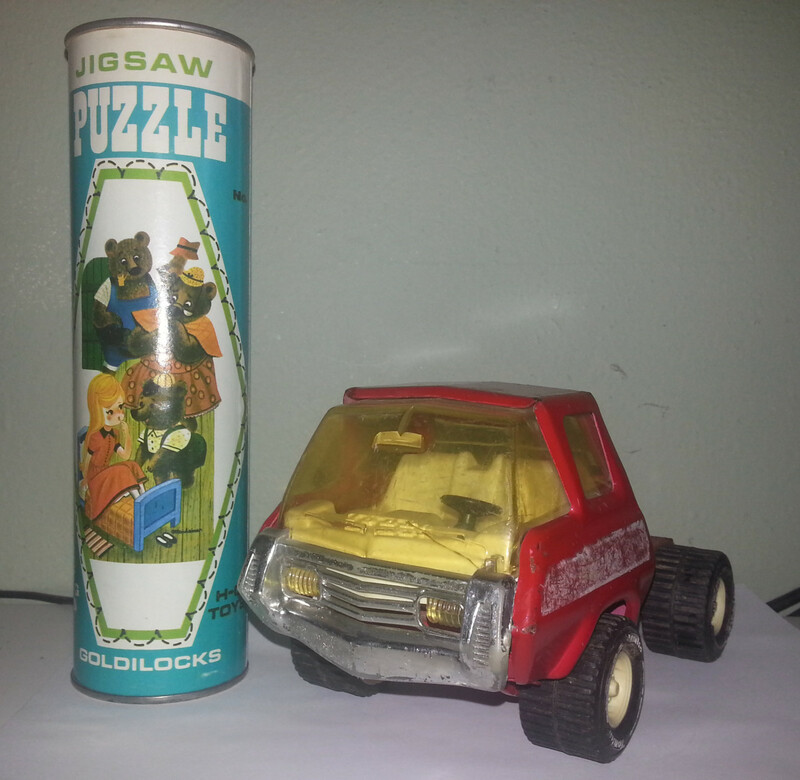 For example, off-road racers will require a much heavier weight oil than carpet racers. Seems like these hands are a bit too wobbly for these takes. I sure enjoyed racing in the stock RC class while I was able to though. Might have been more expensive than racing a real car! Ooops...thanks for pointing out that punctuation and spacing boo-boo. Fixed! LOL I wouldn't mention this except that I came here from your advice hub. You might want to double check the section on Testing the Operation!